Just a small mod unlocking some stuff for Steam Version [v1.06b]. 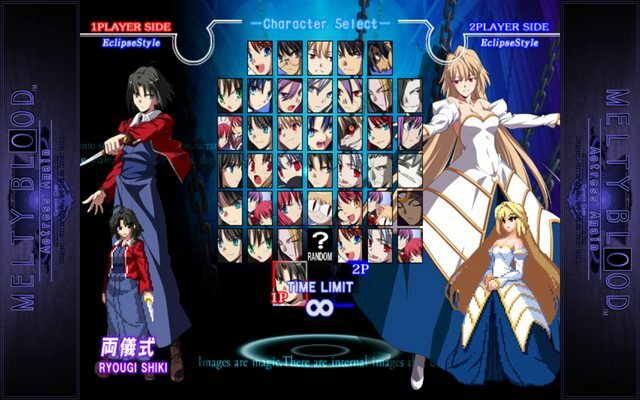 Install: copy all files in "MELTY BLOOD Actress Again Current Code" game folder with .exe replacing. Can you please make a version of the mod that only unlocks the stages? Some stages seem to show up twice on the select screen however. Is this intentional or a bug? Try to compare these stages and you will see. Actualy doubles is old versions of the stages. 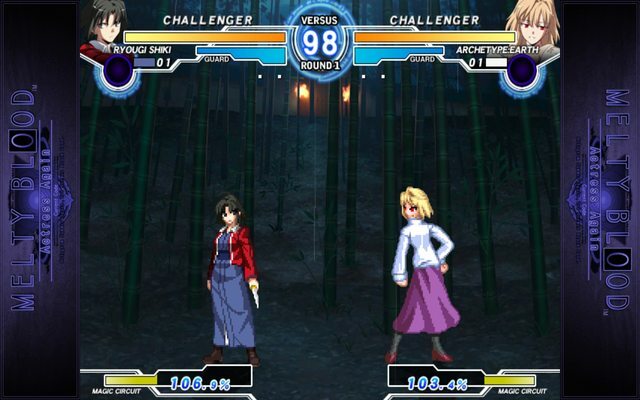 From the very first Melty Blood sorta. OK I get it now, it's just that some stages looked the same. 1) Can you make it so the Eclipse Style replaces the Half Moon Style? 2) Can you make a mod that makes the background in the character select screen blue like in your screenshot? Thanks for the amazingly fast answer. Can you explain to me what is the difference between the Eclipse style that all the regular characters have and the boss characters that get added? Also why are there two Dust of Osirises? Sorry if I'm being annoying with my constant requests but you seem to know a lot about how the game works. Actually, I have one small idea. Maybe, in next version to make exe-file separate like Erkz did with Boss Rush. For example, now I use 3 separate exe-files: 1st - for official version, 2nd - for full version of your mod, 3rd - for additional stage only version. And it works well. One more thing. 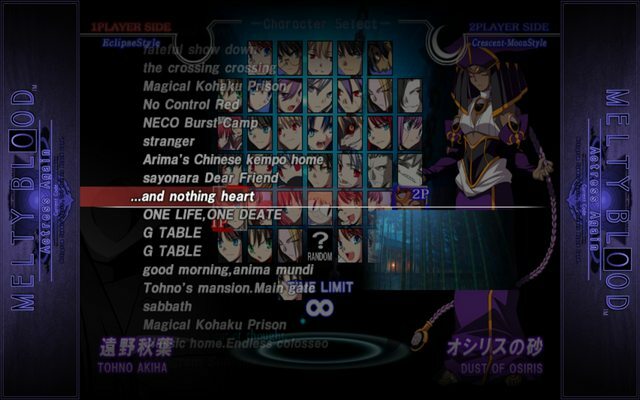 Boss characters (except PS2-Hime) have no actual arcade mode. You can add for them by 3 ways. 1st - use routes of regular version characters. 2nd - use routes of regular PS2-Hime (it has no story but have fight route). 3rd... I think, you can use Boss Rush routes because tough fights for tough characters. And, please fix PS2-Hime on select screen. Listening. I could fix the dump you used to extract the files 000x.p the steam version so that they do not appear distorted after extraction and try to put together a mod with the official translation, if possible? 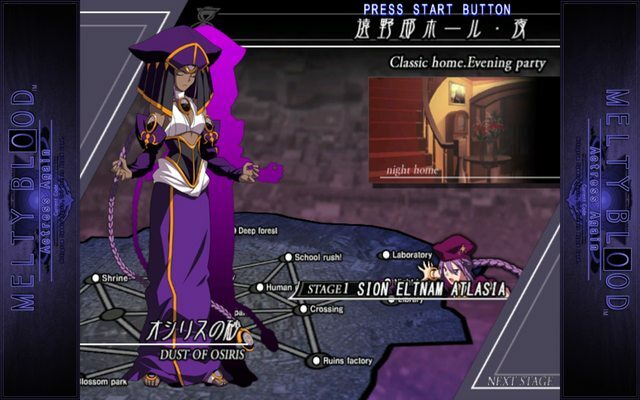 Choosing Boss Aoko Crescent Style crashes the game. Crescent Style for all bosses and Dust of Osiris from Boss Rush Mode has been deleted. Congrats on making Eclipse selectable. On the other hand, I'm never playing Ranked again, lol. What happens if you try to play online with a mod user without having it? The game doesn't synchronize inputs until just before the match starts, just values, so if you choose anything that doesn't require additional files or settings to be enabled in order to work, it will. This includes Eclipse!Ries and Eclipse!Princess. This does not include Boss Characters like G Akiha and Dust. Not sure if it includes stages. Hmm... I wonder if this can be used to port Erkz's boss rush mod that we... *cough*. This is only for steam version? Yes. It is. Only for Steam version. This includes Eclipse!Ries and Eclipse!Princess. It would be better if this mod does not include Network Mode. I really want Boss Rush Mode. And I believe it is possible to make boss version and regular version into one character. But… it doesn't make sense maybe. sorry for reviving a dead topic, i recently downloaded this mod and its pretty sweet. couple of errors ive ran into, sions eclipse mode crashes the game, arceuid forward back move and a couple others dont preform. hisui and kohaku plants are glitched, only graphically tho and they also cant preform there arc drive at all. im fine with the glitches but is there any way for sion to not crash the game? Page created in 5.149 seconds with 30 queries.